This troubleshooting guide for Samsung Front Loading Washing Machines will assist you to fix your washer. We list common washing machine troubleshooting methods and list the error or fault codes that may appear on your Samsung washers display. These troubleshooting methods and error code definitions will allow you to diagnose, repair, and fix your Samsung washer yourself. If you need any assistance fixing or repairing your Samsung Front Load Washer, please leave a question below and we will be more than happy to assist you. Press the Start/Pause button to stop your washer. Your washer door will remain locked during the heating portion of the Sanitize cycle. It may take a few moments for the door lock mechanism to disengage. Door switch latch may be bad – Replace Samsung washer door latch if necessary. Check the fuse or reset the circuit breaker. If there is a drain restriction, troubleshoot it. Close the door and press the Start/Pause button. For your safety, your washer will not tumble or spin unless the door is closed. 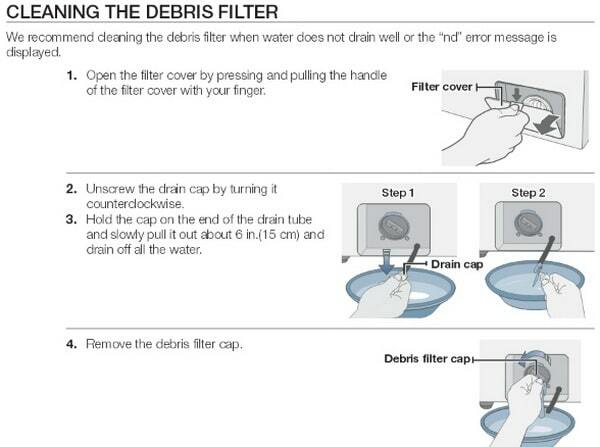 Clean out the debris filter – If this is clogged the washer may not drain. Be sure the door is firmly closed. Be sure the water source faucets are open. Be sure to press the Start/Pause button to start your washer. Before your washer starts to fill, it will make a series of clicking noises to check the door lock and do a quick drain. Turn both faucets on fully. Be sure the door is tightly closed. Straighten the water inlet hoses. Disconnect hoses and clean screens. Hose filter screens may be clogged. Open and close the door, then press the Start/Pause button. 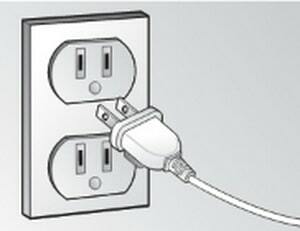 Plug the power cord into a live electrical outlet. Close the door and press the Start/Pause button to start your washer. There may be a pause or soak period in the cycle. Wait briefly and it may start. Check the screens on the inlet hoses at the faucets for obstructions. Turn both faucets to fully OPEN. Make sure the temperature selection is correct. Make sure the hoses are connected to the correct faucets. It should be set to deliver a minimum 120°F hot water at the tap. Also check the water heater capacity and recovery rate. Disconnect the hoses and clean the screens. The hose filter screens may be plugged. Be sure all hose connections are tight. 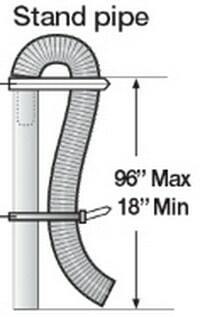 Be sure the end of the drain hose is correctly inserted and secured to the drainage system. Use high efficiency detergent to prevent over–sudsing. Use the High or Extra High spin speed. Use high efficiency detergent to reduce over–sudsing. Very small loads (one or two items) may become unbalanced and not spin out completely. Use high efficiency detergent to prevent over-sudsing. Reduce the detergent amount for soft water, small or lightly soiled loads. Non HE detergent is NOT recommended. Be sure your washer is running with sufficient water pressure. Be sure the Detergent Selector dial is in the upper position when using granular detergent. Be sure your washer is set on a level surface. If the surface is not level, adjust your washer feet to level the appliance. Be sure that the shipping bolts are removed. Be sure your washer is not touching any other object. Be sure the laundry load is balanced. SAMSUNG FAULT CODE DEFINITION: Water detected over the safe water level. SAMSUNG FAULT CODE DEFINITION: Jammed key. SAMSUNG FAULT CODE DEFINITION: Temperature sensor problem. FAULT CODE SOLUTION/FIX: Restart the cycle. SAMSUNG FAULT CODE DEFINITION: Motor problem. SAMSUNG FAULT CODE DEFINITION: High/Low voltage detected. SAMSUNG FAULT CODE DEFINITION: Ag+ Kit problem. SAMSUNG FAULT CODE DEFINITION: Too many suds are detected during the washing session. The unit is put on hold until the suds are reduced. Then, the unit will go back to the operation. When it finishes washing, “End” and “SUdS” codes will blink in turn. SAMSUNG FAULT CODE DEFINITION: Unbalanced load prevented your washer from spinning. FAULT CODE SOLUTION/FIX: Redistribute the load, press the Start/Pause button. SAMSUNG FAULT CODE DEFINITION: Door is unlocked when washer is running. FAULT CODE SOLUTION/FIX: Press the Power button to turn off your washer, then restart the cycle. SAMSUNG FAULT CODE DEFINITION: Door is open when washer is running. FAULT CODE SOLUTION/FIX: Close the door tightly and restart the cycle. SAMSUNG FAULT CODE DEFINITION: Your washer failed to lock the door. SAMSUNG FAULT CODE DEFINITION: Your washer has tried to fill but has not reached the proper water level. SAMSUNG FAULT CODE DEFINITION: The door will not unlock. FAULT CODE SOLUTION/FIX: Make sure the door is firmly closed. Press the Power button to turn off your washer, then turn it on again. SAMSUNG FAULT CODE DEFINITION: Your washer is not draining. It can also mean that the unit senses a small clog while draining. FAULT CODE SOLUTION/FIX: Clean the drain filter. SAMSUNG FAULT CODE DEFINITION: Your washer has tried to fill with water but was unsuccessful. FAULT CODE SOLUTION/FIX: Make sure the water faucets are open all the way. Check for kinked hoses. Check the inlet screens on the fill hoses. If you use a Flood Safety Device, then please remove the device and connect the water hoses directly to the unit. Check if the hot water supply hose is connected. 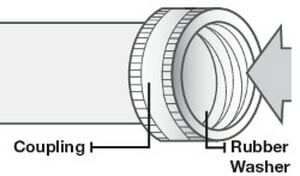 You must connect the hot water supply hose because hot water is supplied by the Auto Temperature Control (A.T.C.) function if the temperature of the cold water is lower than 59°F. SAMSUNG FAULT CODE DEFINITION: The hot/cold water hose connection is not correct. FAULT CODE SOLUTION/FIX: Please connect the hot/cold water hose connection correctly. SAMSUNG FAULT CODE DEFINITION: Problem with control board. 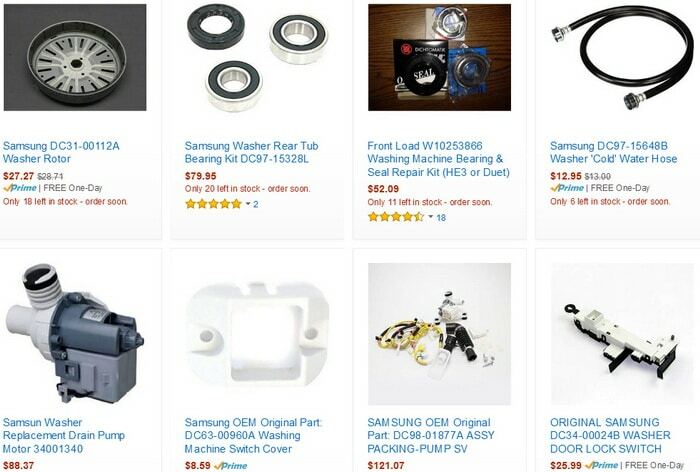 Have questions for repairing your Samsung front load washer? Please leave your question below and we will assist. I have a WF60F1R Samsung front loading washing machine. One cycle which is two hours long and at the 1 o’clock position on the selection dial is is not showing the segments of display rotating CCW. The cycle worked just fine the first time I used it. Now it just rotates display segments and starts to spin the drum and there is no water entering when there should be. Other cycles present no problems. My samsung front load washer will dispense the detergent. WE use liquid HE. However when the washer is done I have a softener water mix filling my softener cup. I’m not sure if the softener is getting in the load or not. Not a single other problem with this washer. At first i tried raising the front of the washer about 1/2 a bubble on the level even though the manufacturer says to leave it level. This did not help so i put it back to level. Any suggestions. My machine stops midway through a cycle with the time distorted. It won’t finish a cycle it just stops with the “alarm” chiming. My washer machine not spinning, code nf. I am using some device for make water very clean but not using hot water. If my washer runs just with cold water can be that problem? Washer is showing error code fl. Door is locked but washer will not start and makes a clicking sound. Cannot get door open. Code is REG on washer and will not spin or drain. Runs down to 10 minutes in spin cycle and resets to 18 minutes over and over. -already replaced shocks all 4 – door lock and computer board. What else can cause this? always fills up with water during the cycle and remains in there till the next time you use it. The second and more troubling issue is there appears to be an issue with the timer. You set the cycle you want eg. it shows 27 minutes. The machine will not count down properly and it may still show 25 minutes, a full 10 minutes after it starts to cycle. So a supposed 1/2 hour cycle can take an hour to run. It’s very erratic. The clothes are still coming clean, I think, but taking forever. Our WF330ANW/XAA 01 front downloader does something similar. Our magic number is 28 minutes. Machine seems to work fine until the countdown timer reaches 28 minutes. No error codes. The control panel on my Samsung VTR front load washer turns on by itself and sometimes changes the cycle by itself too. Washer still works but this is annoying. My Samsung front loader washing machine started stopping at middle of operation and when it was confirmed that the PCB was bad it was changed but it started malfunctioning, the numbers no longer display correctly. Hope to get assistance. Dis assembled washer to replace arm assembly. Got everything back together and plugged it in and has no power outlet is good. Is there a reset button for the computer? Repaired a ground wire in the front that was damaged when removing the tub. My Samsung WF350ANW/XAA will not respond to any commands. The entire panel is illuminated (every button is on and the timer says 88:88) but no buttons are responsive to touch. I have tried cycling the breaker, unplugging for extended periods of time but no change. I made sure the drain pump was clean and not jammed. I replaced the door switch and even the main PCB panel but still no difference. As soon as I turn the power back on, the panel immediately lights up again and is unresponsive. I have verified all resistance tests are within specifications according to the tech service manual but since the panel is unresponsive I can’t enter service mode. I also don’t have any fault codes that I can tell since the panel is lit up like a Christmas tree. Any ideas of the next steps would be greatly appreciated. Thanks! On quick cycle or any other cycle, machine shakes violently during spin but will go to the 7 min mark then stays @ 7 mins, we have to manually move to rinse & spin to get excess water out. 1 load takes like an hour + where should be 25 minutes. Legs are ok. Should we replace or is this a LESS expensive fix. Its $75 to get guy to come & look @ but on top is anything that needs to be fixed, so if going to be a couple hundred might as well buy another maybe? My Samsung Model# WF409ANW/XAA was stuck at 19 minutes for 3 hours during the wash cycle. I turned the washer off. I restarted the wash cycle and the washer filled with water but the drum would not turn, it would just vibrate like it was trying to turn, but will not. I put it in the spin only cycle and got the same thing. I turned off the breaker to the washer for 10 minutes and still got the same thing. I remove the inspection plate off the back and could see the motor on the back of the drum. It would try to turn and was turning itself. I am getting no codes. The washer will pump all the water out of the drum. Turned samsung eccobubble on starts filling with water then programme stops.. Turned it off at the mains put it back on stil the same. My bubble wash vrt plus 10kg has a fault where it will not commence cycle. It drains then it fills and flushes the detergent tray but then will chatter the drum ie like it attempts the turn but applies the drum brake at the same time. Will do this for half hour before coming to a stop. During this time the time counter drops a couple minutes at most. It does not finish the cycle or do anything else. It doesn’t matter if the drum has a small or large load or any load at all it does the same thing. I have ran the calibration sequence many times and it is most times unsuccessful at even completing that doing the same chatter motion with the drum and then draining over and over. The drum spins very freely by hand however so it isn’t a belt or bearing issue and on the odd occasion it does complete the cycle as normal it turns the spins and does everything with smooth precision. I have replaced the main pcb for new in the top rear of the cabinet and the problem remains the same. I am thinking of replacing the front display/touch panel next. Can you give us the model number on your Samsung washer? It will be near the door on the washer frame, look for a small sticker, the model number will be located there. Our Samsung Front Load Washer will not fill with water in the Normal setting but works in all other settings. There are no error codes. Model # WF363BTBEUF/A2. Samsung front loader washer model number WF306LAWXAA, had one time issue where machine was on final spin, time for bed. Woke up the next day and it was still running on high speed spin. Control head was warm to touch and top of machine is warm to the touch. Unable to duplicate. Operating normal at this time. Samsung Ecobubble Washing Machine. When I power on all the lights on front panel flash repeatedly, machine doesn’t operate. No error code. Any ideas? Can you give us the model number of your Samsung washing machine so we may assist you in fixing your washer? On the quick wash or delicate cycle, it adds a little water then counts down for 3 min, stops and waits. No error code….it does nothing. It is just stuck. On normal cycle, it adds water, and runs for 3 min then tosses the clothes forever but the minutes never change. It is just stuck. Why is it sticking at this point? We just had a repair man come. I paid $350 to fix it. He fixed the spin part of the cycle but not this..???? Over the temp setting on my samsung wf50k7500a washing machine, there are 6 symbols. The one which looks like a drum with a diamond was flashing along with the word end at the end of a cycle, but the cycle did not end? When I hit Start/Pause it ended. Why didn’t it end on it’s own? Samsung front load washer model #WF209ANW/XAA–grinding noise of metal on metal during spin (bearings?) along with excessive vibration; excessive movement of drum back and forth, front to back, by hand. (New shocks installed in 8/2017) Any suggestions??? Samsung washer has fault error code 4E. I want to know what problem is with the washer. When a Samsung washer gets the error code 4E, this means the washer does not receive water. SAMSUNG WASHER ERROR CODE NF or 4E = No Water Feed = Washer Not Filling. This means that there is an issue that is preventing your washer from receiving water into the water inlet valve. Here is a page to help you with fixing the Samsung washer error code. Samsung Washing Machine Shows NF or 4E Error Code – How To Fix? I have a Samsung top load washer, model WA48H7400Aw/A2. It seems as though during the spin cycle, it goes way too long then it begins to make loud popping, struggling, grinding noises and wont stop. I must hit pause or it seems it will explode. Please help. 7-E. At first it sounds normal and begins to fill up but immediately stops, beeps and flashes 7-E. What does that mean. My washer keep stopping and shutting off in cycle. What causes this? And what can I do to fix it? Ok last night my washer would not drain. Thus morning i found out why and fixed it. A kinked hose. Now when i go to start the washer it just sits there. It wont fill water it wont spin. The door will lock and will just sit there. I have taken all the wet clothes out and drained all the water and it still wont work. I have unplugged it for 5 mins and still nothing. Same thing iver and over. I have a Samsung Wf306law/xaa and having some trouble with it spinning. I can start a load and it washes and spins normally until it gets to 10 mins (which i think is the spin cycle). The washer spins at a medium speed, it will not go to the fast spin to get all the water out of the clothes. The unit just stays on 10 mins. and just spin at the medium speed. I eventually have to turn it off because it stayed on 10 mins for over an hour. Can someone help me please? Hi our Samsung front loader will sometimes, lock after a cycle for a long period of time… Hours, to be exact. Once in a while it will unlock itself after the cycle ends. Recently the temp inside is, always hot. Any idea what the issue could be? My Samsung washer sprays water from a small opening at the top of the rubber seal at the top of the door, even when the washer has completed the cycle. We have to turn the cold water off during the final spin cycle. You need a new seal for your Samsung washer. Here is where to find the rubber seal for your Samsung front loader. Samsung superspeed power foam steam VRT plus. sometimes after I push start the washer will give a series of loud clicks then do nothing. The lights stay on, it does not shut off power but it does not start washing. I have to go back and turn it off and on again and try again and again and it will finally start washing on about the fifth try. help please. My Samsung Eco Bubble Washing machine sounds like is not working even if the sound button is on. Have a Samsung eco bubble front loader that after 2 years of washing has developed a problem that does not produce an error code, except that we note that the cycle selection light and symbols on the panel are flashing, whereas before they were static. The machine takes in water and drains ok but the drum either does not start rotating or stops after a short time into the cycle. It looks as though it wants to turn but cannot move more than a few cms. When emptied it turns by hand easily. The bottom filter is clean, no pipes are fouled and the machine has stood unplugged overnight. Any ideas??? Hi I have a Sumsung ecobubble washing machine and the front dial to change the settings of the wash is not working and the child lock keeps flashing. None of the other buttons are working either. The buttons make the usual sound when I press it but doesn’t change any of the settings (I. E from 40 to 60 temp). I have a Samsung WF42H5600AW front loader washing machine. When I set the wash to type to “Normal” it will do the quick initial drain but when the water is supposed to start it will cut off and then back on repeatedly and never start the cycle. I can change the wash type to any other on the dial and it will work just fine. So what’s going on and do I need to call a service tech? Is this an easy fix? My washer is reading SE AND NOT FINISHING CYCLE, IT STOPS AT 8-13MINS RHEN I HAVE TO PUSH START TO FINISH IT BUT THAT IS DONE 3-4TIMES BEFORE ACTUALLY COMPLETING THE CYCLE! WHAT IS SE? My washer was working fine until recently. Now Water is coming out the soap tray area all hose are connected correctly and I can’t seem to find a problem what can I do? My samsung washing machine stops in the middle of washing and the display icons blinks (no code). The washer turns a few cm, then a click sounds, and it falls back down.. What can be wrong? We have the same problem…have you found the solution?? When the cycle is done, the washer turns itself off. The door is locked. I have to turn the power on to get it to unlock. Also, when I first start the load of laundry, the door locks, then unlocks, then locks again. Your help would be appreciated. Put powdered detergent in the “liquidity only” section – now it is clogged. Liquid soap will not enter the cycle. How do I clean this? Remove the “TRAY” by pushing a small strip and pull out. Wash it out with hot water in sink. Reinstall into your Samsung washer and it should now be unclogged. Samsung Washer is steaming clothes even without using that cycle. my inverter direct drive top loading washing machine is 3 years old and is not completing the full cycle, it starts the cycle then stops and gives a IE error message..it is a WT1101CW MODEL..S/NO 403PNEBON004. every now and again it washes a full cycle after numerous false starts..what can be the cause of this. please help….frustrated. Washing machine will start the cycle, run for about 30 seconds then stops. No error code displays. No alarms sound. Simply does not ‘run’ through the actual cycle. Still indicates original wash time. Door opens fine. No locks are on. Hi. The drum in my front loader is hard to turn by hand. I pulled it apart and checked the bearing on teh direct drive motor, and it seemed fine. I put it back together and then the drum would spin fine by hand – maybe spin around 3 or so times after giving it a pus. Then i ran a drum celan wash, and after that the drum was tight to run by hand again. The machine is quiet load. Is it normal for the drum to be tight to turn by hand? I couldn’t find anything jammed between the inner and outter drum when i looked through the heat element slot. Is the drum ALWAYS suppose to spin freely by hand? That is, if you give it a push should it spin around a few times Currently it only spins about 1/5th of the way after giving it a push by hand. We have a Samsung WF42H5000 front load washer with VRT. Approx 3 years old and has worked fine until this past weekend. Spin cycle spins and drains but the clothes are wetter than they have been previously. The time gets down to about 6 minutes then jumps back to 12 minutes, then gets to 6 minutes and jumps back to 12 minutes again and repeats that until you stop the washer. Loads are the same as they have been, detergent is the same as it has been. No excessive vibration. Filter has been cleaned. any ideas or suggestions as to what may be going on or how to fix it? Mine does the same at 1and a half years. For $75 a repairman came and said to do self clean with vinegar. No results. I have been in touch with Samsung. I want to know if this is a problem which can be solved or do I need a new washer. I am still working on this. If you watch closely you will see water added before the minutes jump back. My washer is the same model. I would love to see and update to this post if you have any luck. Mine started doing this exact thing last night. Realized after 3 hours the same load had been in an infinite loop; spun and rinsed roughly ~4 times at least. Ours is doing the same thing. Spins down to 10 minutes or so and then resets and starts the rinse spin all over again indefinitely. The washer is less than a year old. My Samsung front load washer has a error message that there is a temperature sensor problem. My model # is WF.448AAP/XAA . My Samsung WW12H8400EW/EE will not start any sykle. The drum won’t rotate. It moves on centimeter back and forth. But won’t go. It can work fine half sykle and then trouble again. I can film the problem if that helps and send on mail. Is it motor or main board trouble. No codes in display. If I leave the machine it goes on pause in program. My Samsung washer just died, what I mean is I lost power on the front display, I check the the plug circuit breaker and checked out good, the door is locked, my wife washing clothes when it just stopped, can you help me? Flashing lights on panel and won’t start sometimes. When it does it only goes half way through the cycle and stops. Hi Mandy – we have this problem as well. Machine was new yesterday, we’ve done three washes and now it has the same problem as you. Did you get a solution from anyone? On my Samsung front loading washer, the front panel lights flicker occasionally and sometimes show 2 lights in one selection field making it difficult to know what settings I have selected. Would this indicate a problem with the main control board? Just replaced Samsung drain pump now the washer will not power up. Checked plug in and fuse box. My Samsung Front Load Washer – WF350ANP/XAA. It shakes when it gets to spin cycle. Its as if the belt that turns the tumbler is broken. I’ve found pieces of rubber in the filter. Samsung VRT Steam shut off during wash cycle. Replaced both boards as diagnosed by Samsung service tech and still won’t power on. No activity, lights or power! Not the outlet, circuit or anything with the electrical going into the washer. I spent $400 on parts and labor for a 4 year old washer! My parents GE lasted for 20 years! My Samsung WD8704RJD won’t power up. I had put a wash on and noticed 10mins later it had powered off. The water has drained and the door unlocked. I have changed the fuse and tried the trick of turning power off and on and gain. I keep getting error code 3E. Have checked and cleaned lint filter, checked for kinks in hose and obstructions. Next day and still having the same problem. Machine is fine until it gets to spin cycle. Please note:- Sorry I forgot to mention machine details! It is an Ecobubble 7.5L WF1752WPC. My front-loading Samsung washing machine is 4-5 yrs old. (wf0804w8n) It now makes a horrible noise, when it spin in high speed!!? My Samsung WF203ANW/XAC does the same thing …sounds like a jet engine when it gets going in the spin cycle…I’ve been told it is the bearing but I think not because I have allowed this to go on for months with no affect on the washing machine…I believe it is the electrical motor that drives the belt that drives the tub…any thoughts? I cannot select the cycle and start my Samsung front loader washing machine model no. WW70J3283KW, 7 kg. I can turn the machine on and off though. It shows an error (red lock) in the display. Please help. I have the same problem-any answers out there? My Samsung front loader washing machine model no. WF8750LSW will not start when I press the start/pause button. I can turn the machine on and off and I can select the cycle but then i can’t start it? Any ideas? Try to reset the Samsung washer by removing power for 10 minutes. Reapply power and see if this may fix it. If not you may have a faulty control board or a wiring problem. There is always water in the detergent container of my Samsung washer at the end of each wash.
Has anyone had this problem before and if so what can I do to stop this. Same thing happens to me. Don’t know if the drain is plugged somewhere or not. Have you found out what is causing it? My Samsung VRT front loader is about 6 years old and will not drain. I have drained the water and checked the trap which are clear. It then ran a cycle fine with out clothes. Put clothes in and won’t drain again. I have a Samsung Front Loader Washing Machine 7kg Bubble wash.
Its approx 5-6 years old. I have a 3E code in the display. I have turned power off both on machine and wall and left overnight, have tried all different cycles. The cycle will start for a few seconds then stops and the code 3E appears. Anything else I can check for. Could this be a major issue and/or expensive repair? Samsung Washing Machine 3E error code can be a loose or damaged stator or hall sensor. Check the hall sensor as it could be loose. Also it may be an error code to indicate a drive motor tach fault. If you unplug the washer for 15 minutes does it clear the error code? My front load Samsung washer model #wf328aaw xaa will not spin. Could smell rubber burning. How can I replace the belt. Samsung front load washer. Takes 3 hours to wash a load of laundry. Setting says 51 minutes. I have a brand new Samsung front load steam wash that gives me a 4C code once it starts. It gets stuck on the same time (usually 11 minutes) for an hour and beeps. If I press start, it tries to continue and then I get the same code? Samsung 2.2 Cu Ft 12-Cycle HE Steam Washer, This washer is practically brand new, but does not complete spin cycle. any idea why? Machine stopped working and has error code SE. My Samsung Washer Activ 9kg locks up and will not drain and spin? It is a new machine. The key above wash, lights up and locks machine. I have a new Samsung speedspray powerfoam vtr plus and have the light when the front door is open but will not turn on. The display screen seems to have no power. Is there a circuit that services this screen. I can’t even have it run its own diagnostic due to a dead screen. If your Samsung washer LED screen has NO POWER, you most likely have the board unplugged possibly from vibration. Unplug washer, remove panel, check to be sure the main control board wire harness is plugged in and secure. If it is, the board may be dead and you need to remove and replace. Troubleshoot with a multi-meter before ordering a new control board. My Samsung Eco Bubble WF0804W8W has washed wool and silk clothes at too high temperatures but no error code is shown in the display. What can I do? Is there a way of getting advanced error information from the display about for instance heat sensor failure? My front loading washer puts water on the load at the wrong time. During the final spin cycle, water is being put on the load so when it’s done the clothes are sitting in a puddle of water. It even happened once when the load was completely finished – power was off and door was unlocked but water was still coming in the tub. I had to turn the water off at the faucet to stop it. Most of the time there are no error codes but occasionally the water gets too high and it gives an OE code. You have a possible water inlet valve issue or the control board is malfunctioning…. more troubleshooting is needed. Is it worth calling a repairman or should I just but a new machine? This one is 5 or 6 years old and I wash 2-3 loads per day. A control board sounds expensive. Check around with appliance repair companies, even use CraigsList to find techs who are out on their own and repairing appliances, they are usually licensed and come out to troubleshoot for about $25 US Dollars. If you find or a repair person tells you the board needs to be replaced, check on Amazon for SAMSUNG WASHING MACHINE CONTROL BOARDS. They are usually inexpensive and will likely fix the issue. My Samsung washing machine WF8550NHW (WF8550NHW1/XTL). Its over 5 years old. The drum shaft was replaced two years ago. Past 3 months, it keeps giving 4E when it reaches 8 mins, I just hit start and it runs fine and completes. Today, it just shuts off every few mins. I unplug and wait for a min and plug it again and it continues for few mins and shuts off again, it happened several times, after 4 hrs the wash completed, I put it in quick wash 29 mins every wash from day 1. No clue what caused the problem. I checked water flow, inlet is fine, drain is fine, filter is clean no debris. After the wash completed, I removed the cloths and tried again, within few mins it shut off, I turned it on again and the water drained. Now no clue as to what to do. The Samsung Washer 4E or NF error code indicates a water inlet problem or the machine cannot feed itself with water. Make sure the source water tap is turned on and check the water pressure. -Turn the water tap OFF. 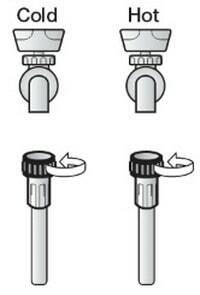 -Remove the water hose from the tap and dispense the water into a sink. -Check if water supply is good. -Check, remove, and then clean the first mesh filter. -Check and clean the second mesh filter. -Test the unit by turning it on and by performing a normal wash cycle. If this does not fix the washer, you may need to replace the control board if it keeps shutting off. It now makes a horrible noise, even on gentle agitation. The inner (steel) drum has come loose from its supporting shaft, hits the outer (plastic) cylinder. I have error 3e and how do we restart the washer? I have tried unplugging and replugging as well as starting the washer but it does not works. Is there a specific way I should restart the washer? No water going into my front loader washer. Checked everything. I think I need to reset the code. Had to do this before, but can’t remember how. I have a red flashing basket light after the cycle. What should I do? What is the model number of your Samsung Washer? My Samsung front loader eccobubble 8.0kg wf1804wpc shows red flashing basket at the end of washing and spin cycle???? Please help. Same here. Flashing red drum sign. Any ideas? Drum seems to be less free as well. The red flashing basket means it wants to be cleaned, according to the manual (I’ve got the same red drum flashing at the end) There should be a SelfClean + button. Had a plumber come to the house and he used a hydro-jet machine to clean the drains and now the red light flashed. My Samsung is a front loader and we have a puddle of water on the floor on the side that the soap is added. Hoses are dry.no leak there. Any solutions? My Samsung washing machine WF8550NHW (WF8550NHW1/XTL). Its over 5 years old. The drum shaft was replaced two years ago. Past 3 months, it keeps giving 4E when it reaches 8 mins, I just hit start and it runs fine and completes. Today, it just shuts off every few mins. I unplug and wait for a min and plug it again and it continues for few mins and shuts off again, it happened several times, after 4 hrs the wash completed, I put it in quick wash 29 mins every wash from day 1. No clue what caused the problem. I checked water flow, inlet is fine, drain is fine, filter is clean no debris. After the wash completed, I removed the cloths and tried again, within few mins it shut off, I turned it on again and the water drained. Now no clue as to what to do. Samsung Washer – the temperature change button makes a beep, can lock to mute sounds if I hold it, but the indicator light will not change and is stuck on cold. Very loud and EXCESSIVE spin vibration. Had to shut it down for fear of some significant damage. Not an excessive load by far. Rearranged the load, restart with same result. Reduced the load and STILL this outrageous vibration. Trouble shooting section in manual no help. Not rushing to call appliance repair until I get some insight to this sudden onset. My Samsung washer adds time after it started and we wash with cold water all the time and we never had any error code!! How do i reset it or what can i do to fix it. If it is the main board can i get one online and change it myself? My Samsung ecobubble keeps showing code ue. After redistributing load also adding and subtracting items I have restarted spin and drain it sticks at 7 then the code shows code ue again. I’ve tried restarting wash programme from beginning same thing happens. The filter has been cleaned I’ve also emptied machine and recalibrated the machine and tried again without success please help. The drain hose on the new Samsung washer is very long. Standpipe top for discharge is at height of washer. The hose has a large loop because of its length. Is the solution to cut the discharge hose to a shorter length to eliminate the loop? My Samsung ecobubble front load washer doesn’t want to open. The connection to the water supply is no longer available so I’m trying to get my clothes out but the door won’t open. When water is still in the washing machine, the door cannot be opened. The door is automatically locked for Safety Reasons when tub is filled with water. Check this SAMSUNG washer door will not open page. My samsung front loading machine creates too much noise like stone crusher at the end of last 20 minutes in overall time period of 130 minutes. It looks like inside it is washing the stones that kind of sound in creates loudly. I’m the owner of a Samsung washing machine WF 407. No matter what cycle I set it on it runs down to either 7 or 19 mins and will stay and just keep running. Won’t count down to zero to finish any cycle. No error Lights come on either. l already replaced the interface but didn’t solve problem? I have a similar issue. My washer will count down and then up and then down again and never finish a wash cycle. Had to resort to pro repair. He is coming tomorrow to “install a sensor” with no guarantee of a fix. Under factory warranty. My samsung front load washer fills with water but will not spin. It just hums. Then at the end it gives the code nd. I have drained it and checked the filter but it does same thing. I can however spin it by hand. I have a front loading Samsung washer. Once hitting power it goes thru 6-7 loud clicks then I get error message “Lo”. I have unplugged for 20 seconds but still same issue. The door lock assembly may be faulty electrically, may be cracked and or damaged, and or the wiring from the door assembly to the main control board may be loose. We have a Samsung Washer Model # WF241ANW. We are getting no error codes. The control board works in that all the lights change and buttons work. The problem is when the start button is pushed some clicking noise but no action. Once it did start and only ran for 1/4 a cycle than would no longer run to finish the cycle. If the Samsung Washer has no error codes but when you go to start it only clicks, you may have a motor capacitor issue, wiring problem, or a possible bad control board that is not communicating properly. You can test the motor capacitor to be sure it is working. If the capacitor goes out, the washer motor will not start or run. When the washer did run for 1/4 of a cycle, did the washer make any strange sounds? What did the washer do the moment it died out in the middle of the wash cycle? No flashing buttons or beeping sounds? Did the washer still have full power when it stopped mid cycle? My Samsung top loader washer only accepts washing on quick wash but other modes gives F and doesn’t allow to start. At first it just filled up with water (overfilled) and then drained without spinning. From there it doesn’t start on all other modes except quickwash, all other modes gives F error code. What could be the problem? It was fine all alone, started out of the blue. it is 3 years old. My Samsung eco bubble front load washing machine is showing an error HE-1. My front load Samsung has the error code ND, checked for any clogs and replaced the pump, made no difference… now it won’t let me open the door??? Any thoughts? Check all wiring harnesses from the control board out. Check drain hose for clogs or bent. Is drain in home clogged? Are you getting a different error code since now the door on your Samsung washer does NOT OPEN? I have a 10kg Samsung front loader, the code 3E comes up more times than not, I have replaced the motor as I read that was what the code referred to. When the machines starts it will turn a few times then the washer tub seems as if it get jammed and makes a slight noise that sounds like the tapping of a stainless bowl then the code comes up. My Samsung front load washer runs through all cycles fine but at the end of the final spin it fills with smoke that smells “electrical”. Model # WF209ANW/XAS. No error codes appear on screen. What can the problem be and how can I fix it? If your Samsung washer door has dropped slightly, then this means the door hardware has become loose and needs to be tightened. 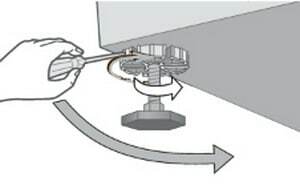 Try and hold the washer door upward in the correct position while you tighten up the screws. If the screws or hardware is not loose, the front load washer may have gotten bent downward. If this is the case, you need to remove and replace the hardware that holds the door to the washer. samsung front loader washing machine would not turn on. i have check the power outlet. i have checked the plug. i have checked all the obvious possible faults, but still does not power on. it happened after a power cut in our street. when power came back on, my washer would not turn on. My Samsung front loader will not fill up with water in only some of the wash modes. When I put it on a quick wash it has no problems finishing the load. But in normal wash mode it won’t fill up with water. I tried to start a load, but it wouldn’t fill with water. A red light on the led display has come on and I don’t know what it means. It is a circle with a line through it. I stopped and restarted several times and it now works, but the red circle remains. There are no codes being displayed along with this red circle. Please let us know the model number of your Samsung washer and we can assist you in troubleshooting the NO FILL issue on your washer. My Samsung Eco bubble front loader washer is showing error code 3E. Restarting the cycle brings up the code at the “spin” section of the cycle at each of 2 attempts. Any thoughts as to what is the problem? 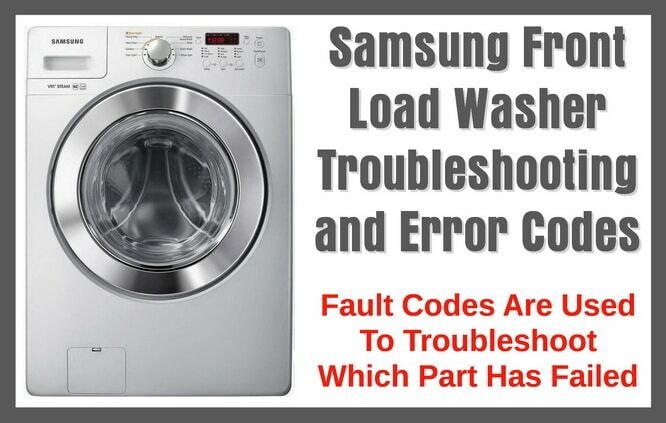 Samsung Front Load Washer Error Code 3E = indicates a drive motor tach fault.